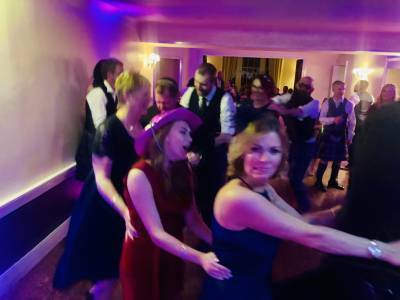 Als events and weddings ,Scotlands premier wedding dj with over 15 years experience Al can tailor make your event to help make sure your special night is not only fun but also memorable . I offer 2 packages to suit all budgets and venue types . client meets are offered where we can sit and plan your special event ,with professional grade modern lighting and sound systems and with extensive training by the top dj,s in the business, who better to choose than to host your event than a dj who will interact with your guests and help make your memorable . Als events and weddings specialise in weddings and corporate entertainment My mission statement is to exceed your expectations in all aspects of communication and entertainment by applying a professional and personal approach to your event. I will strive to display my reliability, integirty and experience by going the extra mile for you, aiming to create a wedding reception and parties that make memories. Required by many venues, Als Events and Weddings has a current PLI policy with AMP DJ in the amount of £10 million. Also required by many venues, Als Events and Weddings has supplied satisfactory evidence of holding current PAT inspections of their equipment dated within the last 12 months. A Method Statement outlining Als Events and Weddings&apos; Health & Safety procedure for setting up disco equipment has been provided. Als Events and Weddings has provided Risk Assessments undertaken at events sourced via needadisco.com, indicating that they can undertake these competently. Why do people choose to book Als Events and Weddings? All day service and appeared professional. Been to venue before. They had the best package for what we are looking for at our wedding. has worked at our venue in the past and provided the most competitive quote. 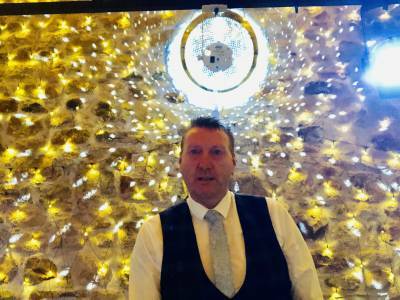 "Alistair was very professional and the music and his set up was just what we wanted, he made our evening so enjoyable and added the final touch to our perfect day. Thank you so much." "Thank you it was a pleasure hosting your wedding and you and your quests made it so much fun ,all the best for the future"
"Big Al was great and kept the music at a good level and his whole show was excellent"
"it was a pleasure entertaining you and your guests and once again congratulations on your ruby wedding anniversary"
"Myself and my husband both agreed that Alistair was fantastic. We could not have asked for anyone better. The music choices were perfect, they had everyone on the dance floor all night. The lights, dancing on clouds and the names on the floor were so pretty and added that extra wow factor. We would recommend him to everyone planning a similar event, even our guests were commenting on how brilliant the evening entertainment was." 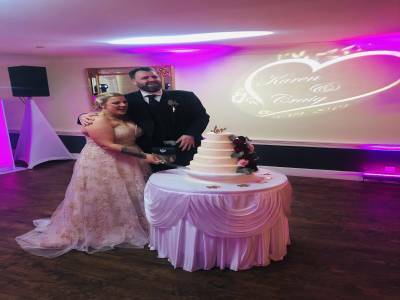 "thank you and your guests for making it a great experience for you both on your wedding day and happy to provide the wow factor on you special day"
"Had a great party !! Dance floor was packed and everyone loved the music :-)"
"thank you to you and your guests 80,s is my favorite era and was great to celebrate fantastic tunes and fun on the dancefloor especially the rollerskating and the opps upside your head"
"Unfortunately the hotel lied about there being wifi in the function room and this caused problems for the DJ. However they handled it very well and were lovely. 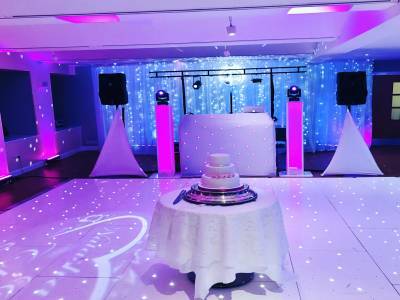 Thanks so much x"
"all these little issues make to job in hand more challenging ,so glad we could help overcome a few minor issues and make it a night to remember"
"I would without hesitation recommend this DJ for any event. The age range was 15 to 70. Everyone enjoyed themselves and our guests are still talking and laughing about the party a week later. Thank you for helping make my daughter;s 21st a special event." "fantastic night of disco and karaoke in the living room ,thanks for all who sang on the karaoke and made it a night to remember"
Als Events and Weddings also offers a range of additional party services not directly linked to musical entertainment. If you are contacting Als Events and Weddings about an event, it's always a good idea to include the DATE, LOCATION, EVENT TYPE, AGE GROUP and TIMINGS to speed things up!